Bearded Collies are recognized for their shaggy coats. Beardies have short muzzles with long hair underneath, hence their 'beards'. They are muscular medium sized dogs which resemble their ancestors, the old English Sheepdog. Known for her "bounce", the exuberant Beardie will charm you with her joyous, affectionate, happy-go-lucky ways. 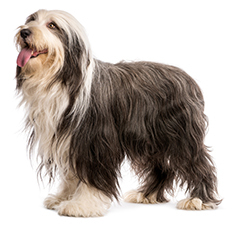 A Bearded Collie's coat changes during various periods of its life. Puppies are born black, brown, fawn or blue, soon after fading to light gray or cream. As beardies mature, they darken again to either black, brown, blue, or fawn. 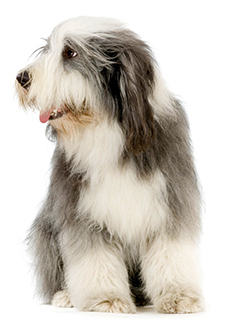 The Bearded Collie's final coat color is somewhere between the puppy coat and the yearling coat. Average shedders, Beardies should be checked regularly for ticks and parasites. Their thick, shaggy coats should be brushed daily, and combed free of matting. Described as exuberant, happy go lucky and affectionate, the Bearded Collie is a natural herder and sometimes a barker, but they do not make good watchdogs. Beardies should not be left alone with nothing to do. Male beardies are more outgoing than female beardies. Beardies are prone to hip dysplacia, and their profuse coats should be checked regularly for parasites. The Bearded Collie can be expected to live about 14-15 years. Bearded Collies prefer to live with a family that is active and outdoorsy. Beardies make excellent farm dogs, they love the outdoors, even harsh, wet weather and should never be confined indoors. Bearded Collies love to run free for exercise. Find Bearded Collie Puppies with our Free Breeder search!